← Go Ga Ga for Gogola! As the Thanksgiving holiday creeps closer and closer you want to find easy meals to make in the days before so that you can focus in on anything that needs to be taken care of for your holiday plans. One dish meals are ideal when you can get them together fast so you don’t even have to think much about dinner for one night. This recipe, from Bon Appetit, is just about a one dish meal. All you need is a vegetable on the side to finish the meal off and you can have a great tasting meal of roasted chicken with chorizo and sweet potatoes. Preheat the oven to 425 degrees. Season the chicken pieces with the apple cider vinegar, kosher salt and black pepper. Set the chicken aside. Heat 1 tablespoon of the olive oil in a large skillet set over medium high heat. Add the chorizo and cook, stirring the chorizo occasionally, until it is beginning to brown, about 2 to 3 minutes. Add the chicken, skin side down and cook the chicken until the skin is a golden brown, about 5 to 8 minutes. Toss the sweet potatoes, garlic, red onion, white wine and the remaining one tablespoon of olive oil, along with the rosemary (if using), until everything is coated and well mixed. Place the sweet potato mixture on a rimmed baking sheet in an even layer. Place the chicken pieces and the chorizo pieces on top of the vegetables and roast the chicken until it is cooked through and the sweet potatoes are tender, about 20 to 25 minutes. Divide the chicken and sweet potato mixture among the plates and garnish with additional rosemary, if desired. 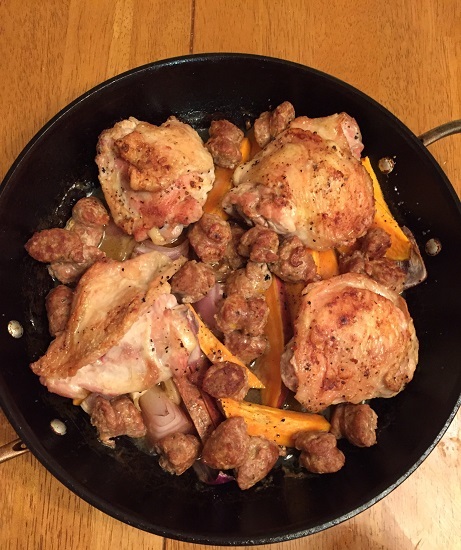 I really enjoyed the mix of the chicken, chorizo and the sweet potatoes. The chorizo added just the right spiciness to the dish and the potatoes were great roasted and mixed with everything. The chicken had additional flavor from marinating briefly with the cider vinegar to add to the dish overall. I served this with a simple green vegetable on the side and everything was done in under 45 minutes and clean up was a breeze. I used chicken thighs instead of breasts, but you could use whichever chicken pieces you have on hand and like best; I think it would do just as well with drumsticks if you prefer. That’s all I have for today. Check back next time for another recipe. I’ll be traveling over the next few days as we head down to North Carolina for the holiday, but I will make some Thanksgiving posts before the holiday along the way, so keep checking back. Until next time, enjoy the rest of your day and enjoy your meal!